My three children ages 6, 7 and 8 love arts and crafts time every day in our homeschool class. They will even request to do a variety of different arts and crafts projects just for fun during their free time too. One of our favorite resources for high quality, affordable arts and crafts products is Lakeshore Learning! In celebration of National Craft Month during the month of March, my children are doing a variety of arts and crafts projects including painting, scrapbooking and drawing. Lakeshore Learning is currently featuring a wide selection of products to help let your children’s imaginations soar with creativity. From various paint and supplies, collage and craft materials, paper, dough, clay and modeling materials, crayons, markers and colored pencils, stamp pads and stampers and arts and craft kits there is sure to be the perfect projects for kids of all ages. 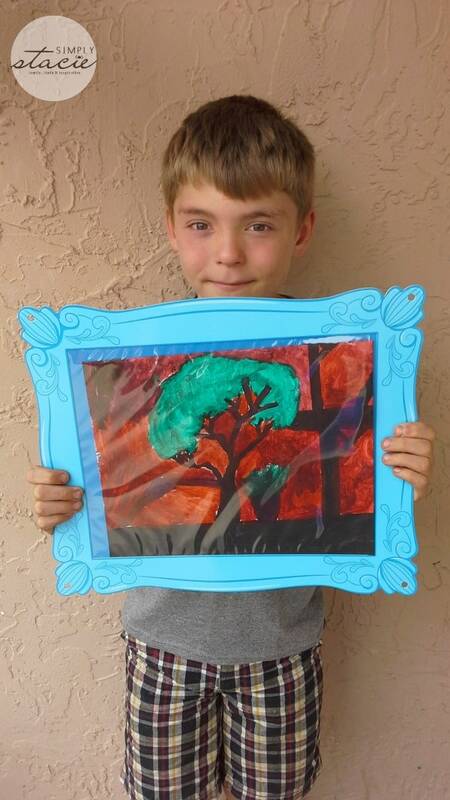 My eight year old son, Adam has inherited the artistic gift from his grandmother who was an artist and he loves to draw and paint landscapes. He enjoys displaying his creations on the wall of his bedroom but it can get expensive to frame all of his work. Therefore, I was excited to discover Look What I Made! Art Frames which are available at Lakeshore Learning. He was beaming with pride when I presented him with a 9” x 12” art board frame so he could display his latest piece of art. In just a few seconds an ordinary paper with your child’s artwork can be inserted into the acetate cover sleeve of the durable, reusable frame and it instantly turns into a showpiece! Each frame even comes with pre-cut holes to make hanging it simple and you can write the child’s name or title on the wet-erase surface to make it even more personalized. In this set you will receive 12 frames (4 each in blue, green and yellow) for the bargain price of only $19.99. This set would be a great way for children to gift a favorite piece of their art work and give it to someone special to treasure. 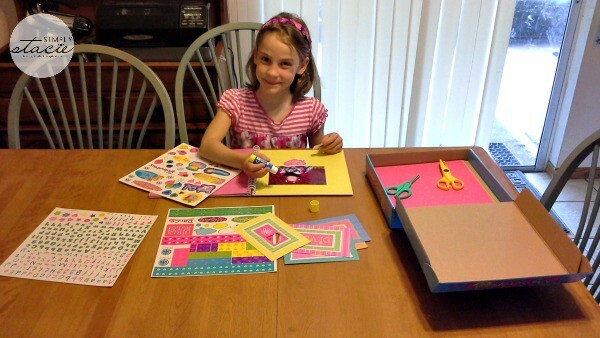 My daughter, Hannah has shown an interest in scrapbooking to preserve her favorite memories. The My Scrapbook Kit (SRP $19.99) is a wonderful all inclusive set which has everything in it that your child will need to make a customized scrapbook. Packed with over 450 pieces, this set includes a nice quality 48-page, spiral bound scrapbook. I like that it is very durable so that the scrapbook itself can be worked on over time by my daughter until it is completed and should stay together nicely. It also has 10 sheets of acid-free design paper, 28 die-cut frames and accent pieces, 350 stickers, glitter glue, craft scissors and much more. 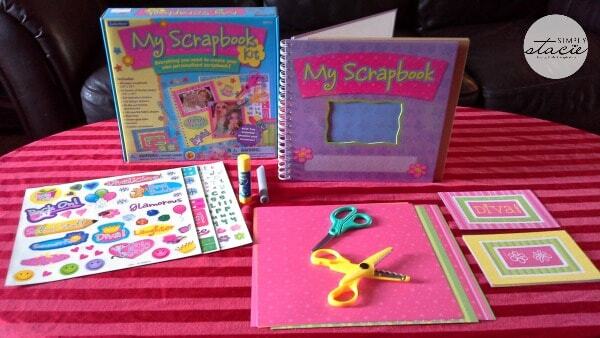 My daughter’s eyes lit up when she saw this scrapbooking kit and she couldn’t wait to get started. She really took her time and was meticulous about making sure each page is done just right. That means that the My Scrapbook Kit is an excellent value in my opinion and my daughter can feel a sense of pride by doing this craft project herself. 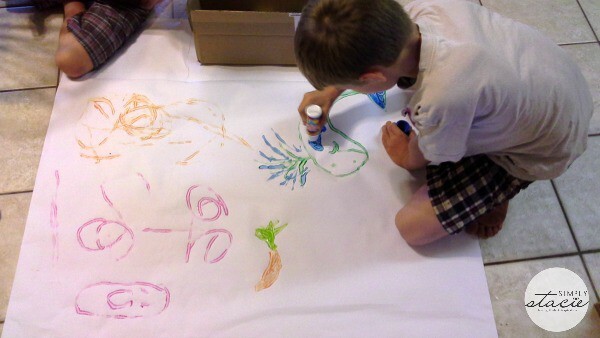 All three of my children enjoyed creating art with the Roll-On Painters (SRP $19.99). This 10 color set is so unique in that kids can paint straight lines, waves, zigzags etc. by rolling the paint onto the surface. These are so easy to use that it would be perfect for even the youngest artists and my favorite feature is that these no-spill painters do not make a mess. It was fun to watch their creativity at work and my kids thought the roll-on feature was a blast. 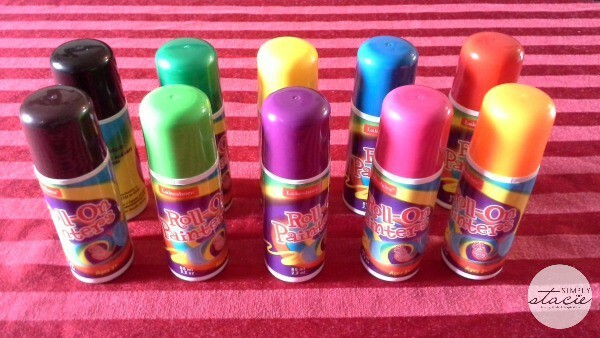 Each 2.2 ounce bottle has a nice amount of paint in it so that the kids were able to use for multiple art projects. I will definitely keep a supply of these paints on hand for future projects. You are invited to visit Lakeshore Learning to browse the entire product line and shop for your favorites for National Craft Month. If you and your child are looking for fun arts and craft ideas then you will love how Lakeshore Learning has set up a specific area of the website to show you all of the different products available. Simply Stacie readers can get a Lakeshore Learning 20% off coupon for any single non-sale item through March 31, 2014! Connect with Lakeshore Learning on Facebook, Pinterest and Twitter. Crafts can be costly, but the pricing isn’t too bad. I love that picture frame craft, what a great idea. Crafts are great encourages imagination, quiet time, art, etc. Kids all seem to love crafts! These all look like great products, thanks for the review on them! Wow this is so neat! Hours of fun and so educational!! my daughter loves this kind of stuff and she loves to paint ! :) thanks for sharing! Lakeshore Learning has excellent crafts! These look like great gifts. I know a little girl who would love that scrap-booking kit! Your son really is very good for 8 years old. I love the frame you go for his artwork. I need to order some for my daughter. Thanks for the review! I have always love Lakeshore learning and these availanle frames and crafts make me think even more favorably of this store/site. I really like this site and I love the variety!! I also like that the are reasonable!! Lakeshore has such a great selection of products and these crafts look great. The scrapbook would be a lot of fun. Awwwww, he’s a cutie! I am a firm believer in trying to develop artistic skills. My grandkids found out they are artistic at school because their parents didn’t like the mess. They get to make a mess at my house! LOL This seems to be affordable too. Fun crafts for many ages and interests. My grand kids loves crafting and being creative. My grandson. Is always making something…some new invention or picture. This is a great site for helping to garnish that.